Cultural awareness training is an integral component in creating environments where cultural diversity is appreciated, and where people from diverse cultural backgrounds communicate with each other respectfully. Ultimately, the goal of this course is to help non-Indigenous Canadians work with Indigenous Canadians in ways that convey respect. 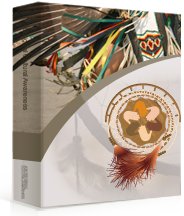 This course is appropriate for employers, employees, and professionals who work with Indigenous people in workplace, education, or health care settngs. The course is presented in 4-modules. Each includes interactive exercises to engage learners and reinforce key concepts. Individuals may choose to listen using the voiceover option, or can turn off audio and read at their own pace. To proceed from one module to the next, participants must pass a multiple-choice test. Those who do not achieve 100% can review the material and re-test as many times as necessary to achieve a passing grade. Test questions are randomly selected from a test bank, to ensure variety in re-tests. When the participant has passed each module test, they can download/print a Certificate of Completion that includes their name and the date of training. All necessary information and resources are accessible within the course. Participants do not need to wait for any materials to arrive by mail. Training can be taken from any location where there is an Internet connection, and participants can access the course using a computer, tablet, or mobile phone. The course is self-paced. Participants can exit at any time and can resume where they left off. The timeline for completion will vary, depending on the learning style of the participant and their prior knowledge of the subject mater. Most participants will complete the course in 1-2 hours.